Step away from the computer! That’s my number one rule for inspiration. 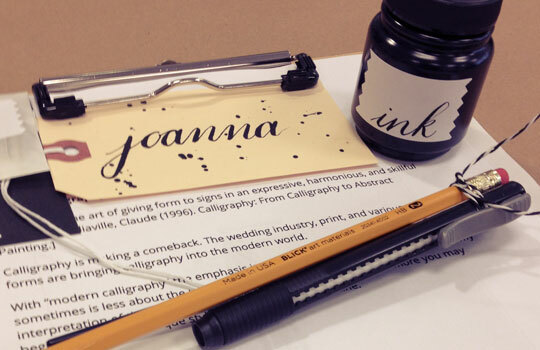 So, when local calligrapher Christie Jones of Swell Anchor Studio bedsidesign announced her intro workshop on modern calligraphy, I jumped at the chance to learn something new in a live class setting. Christie and I met on twitter, and I’ve followed her calligraphy journey there and on Instagram during the past year or so. It absolutely boggles my mind that she’s achieved so much in the short time that she’s been working on her calligraphy business. 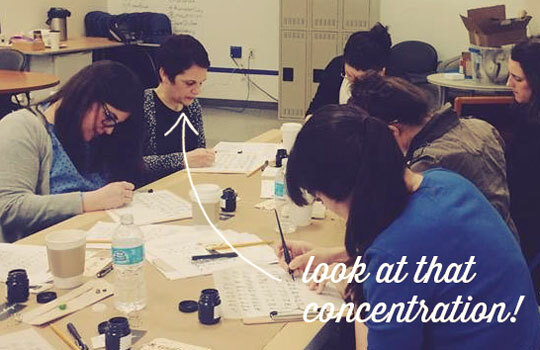 She’s a natural at it—and at teaching too. Calligraphy is completely alien to me. Sketching letters for a design or logo usually involves mimicking or tweaking an existing typeface. Resisting the urge to fill in letters with my pen was super challenging. In my coloring books, I was the kid who outlined the pictures in black crayon and filled them in with a heavy coating of waxy color! 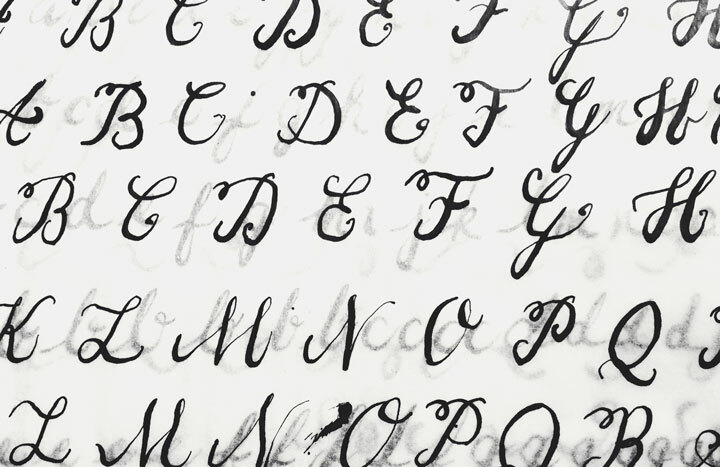 There are so many variables to calligraphy—ink, paper, pressure. By the end of the workshop, I had a healthy respect for the creativity and control that go into making letters look effortlessly organic! Maybe down the road—after much more practice!—I’ll incorporate calligraphic elements into a logo? Or maybe I’ll keep at it just for fun? Either way, it’s a perfect exercise to get the juices flowing. So much of graphic design is about control. Doing something hands-on opens up my thinking every time. This looks soo fun!! And yeah for Christine, I love following her on Instagram. New experiences are always a great way to get creative! Thanks for stopping by, Renée! It’s good to shake things up. I totally agree! It’s always stimulating to challenge the brain. I’m currently learning Clair de Lune on piano. Most challenging piece I’ve ever attempted. I consider myself in between a beginner and an intermediate player. They should have a name for that. Begmediate? At a conference with wonky wifi today so sorry about the delay, Steve. Interginner? Re control, I mean the grids, spacing, and alignment that we (or at least I!) agonize over. So, will there be a recital once you learn it?